When: Sunday Sept 8 2019; 9:00 AM – noon. Meet: 9:00AM at the Sheraton Hotel, 500 Harbor Blvd, Weehawken 07086. Walk starts 9:30AM. Driving Directions: Take the NJ Turnpike Exit 16 toward the Lincoln Tunnel on Rt. 495. Take the last exit, Weehawken/Hoboken, from Rt. 495. At the first traffic light, bear right onto Pleasant Ave and take an immediate left downhill on S. Marginal Hwy. Go to the bottom of the hill and turn right onto JFK Boulevard East. Continue down the hill to the third traffic light. Turn left into Lincoln Harbor at Dykes Lumber and continue straight over the Light Rail tracks. The Sheraton Hotel is on the right. Turn into the parking lot and meet at the rear of hotel. 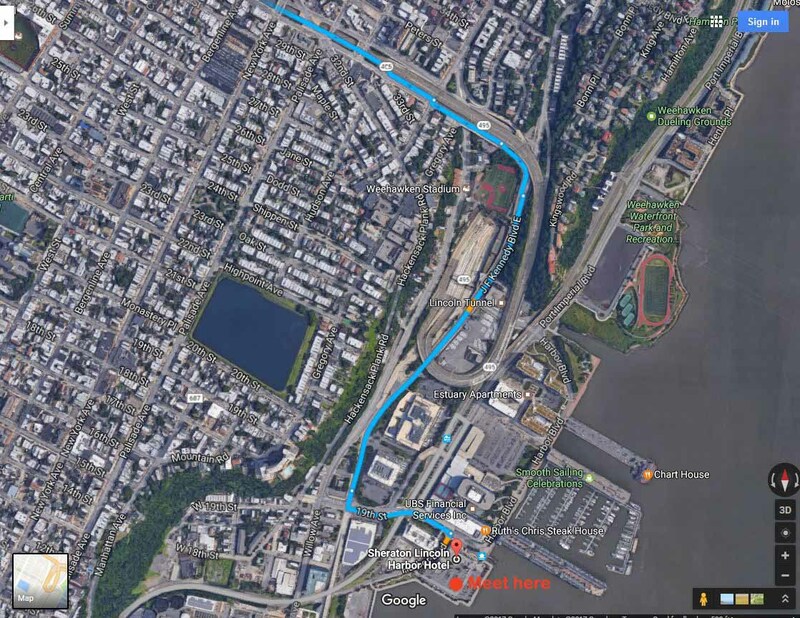 Nearest Light Rail Stop: Lincoln Harbor, Weehawken. Turn right after leaving the Light Rail Station and walk along the path to the traffic light, 19th Street. Turn left and walk toward the river. The Sheraton parking lot is on your right after you pass the hotel. Walk Description – This Walk begins in Lincoln Harbor, a private residential and commercial community being developed by Hartz Mountain. Proceed into Weehawken Park where ball fields, tennis courts and jogging trails have the most magnificent view of midtown Manhattan and the Empire State Building. Pass The Brownstone and Henley on Hudson condominiums near the place where the dual between James Madison and Aaron Burr was held. Next enter Port Imperial, a large retail/residential community that is under development. The Weehawken 9-11 Memorial is in the middle of the Walkway in Port Imperial. Continue past the New York Waterways Weehawken ferry terminal and new condominiums built in West New York.